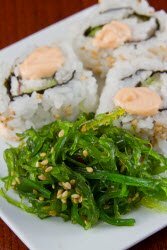 What is Nori and what are Seaweed Health Benefits? Nori questions been keepin' you up Lately? Are there Really any Seaweed Health Benefits? What is Nori? 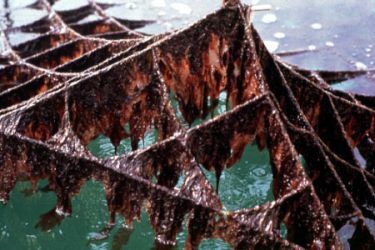 It is the Japanese name for dried edible seaweed sheets made from a species of red algae called Porphyra, including Porphyra yezoensis and Porphyra tenera. 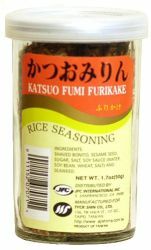 It is probably most popularly know for its use in making Sushi, but it is used in many other applications too. On the far left we have a tuna maki roll which most people are probably already familiar with. It is rolled up in a seaweed sheet typically 7 to 7 1/2 inches by 8 to 8 1/2 inches in size. It is also toasted before packaging and has to be stored in an air-tight container after opening to reduce air exposure and prevent it from absorbing moisture as it will lose its crispiness if it is not. One trick that can be used however to "revive" sheets that are no longer crisp is to pass it lightly over a heat source (such as a gas or electric eye on a stove) a couple of times on each side. Best be careful though, as it will crinkle up fast and even catch on fire if you get it too close or hold it in one place to long! The 2nd picture to the right are Japanese rice crackers. This is a very popular and tasty snack in Japan. In comparison, rice crackers in Japan as a snack are kind of like potato chips are as a snack in the U.S. The 3rd one to the right is a rice ball (or Onigiri). Sometimes these are filled with goodies in the center like Umebushi (salted Japanese plum), Salmon, and Katsuobushi (dried bonito flakes mixed with soy sauce and sometimes sugar---this one is my favorite). And last but not least to the far right is one of my other favorites, a flavored nori (ajisuke-nori). This one being teriyaki flavor. This variety is crisply toasted and normally tastes salty/sweet and comes in small strips about 1 1/2 inches by 4 inches. When I was growing up we would dip the end in a small dish of soy sauce and then pick up some hot white rice with it and eat it. 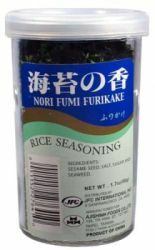 Another one that is worth mentioning is called Furikake, which is a seasoning that is sprinkled over rice. 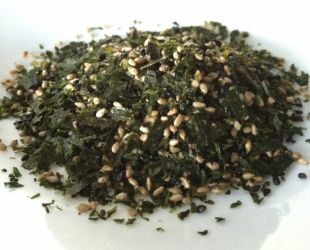 It comes in many different variations which can contain many different ingredients, but most of the time it will almost always include tiny bits or strips of nori in it (see middle picture above). So as you can see, there are many different uses for it besides making sushi and yet we have still only brushed the surface. But hopefully, this gave you some idea of its various applications and uses. Now that we know a little more about it's uses, let's go on ahead and find out a little about where it actually comes from! 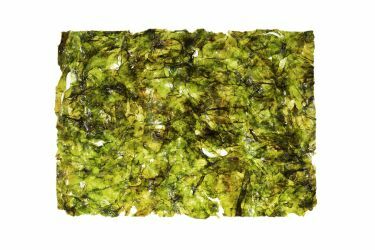 What is Nori and how is it Made? The production of Nori from Porphyra is a big deal in Japan. There are 230 square miles of sea used in producing 350,000 tons whose value is said to be worth a billion dollars. Quite an economic monolith. By contrast, China is said to only produce 1/3 of this amount. Today, farming it is quite the mechanized process. 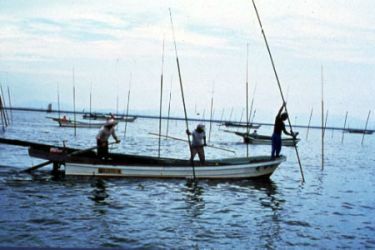 Nets are seeded onshore in tanks and are taken out to sea when they are ready. Within about 50 days of seeding, the fronds are 15 to 20 cm long. During this period they are highly susceptible to disease and have to be monitored closely for water temperature and salinity until harvest. Nori is not sold in a fresh, harvested state. It is always made into sheets. When harvested it is first washed with fresh water and then fed into a shredding machine which reduces it to pieces about .5 x 1 cm in size. Then it is mixed with freshwater, poured into frames and then fed into a machine (similar to a paper making machine) which allows it to drain during the production process. Eventually it moves over a heated surface which will dry it into a sheet. The dried sheets are then packaged and sealed in cellophane quickly so that moisture will not reduce their quality and then they are shipped to their destination. 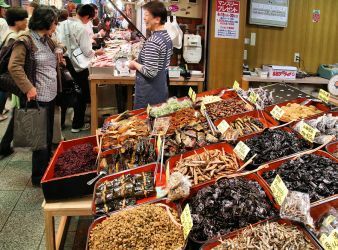 As with almost anything else, Nori also comes in different qualities and grades ranging from very cheap to very expensive and from raw to toasted. If you buy the raw variety, you will need to toast it before use. Cheaper varieties are typically produced in China and may cost as little as .04 cents per sheet whereas more expensive ones from the Ariake Bay in Kyushu, Japan may cost upwards of .90 cents per sheet! Take a look at the picture above on the left. It is a good example of a very cheap variety that was probably produced in China. Notice it is light green, not very tightly woven and is almost transparent. This is one that would be along the .04 cents per sheet variety. By contrast, the one on the right is very dark (almost black), very tightly woven and cannot be seen through. This kind is usually descriptive of sushi nori. Normally you will want to buy the blackest that you can afford. Especially if your intention is to actually make any kind of sushi out of it. Nori is a staple in most Asian diets - especially the Japanese. As a matter of fact, the Japanese manufacture and consume up to 3 times more in volume than do the Chinese with a population of only 125 million whereas China has a population of around 1.3 billion. So it stands to reason that the average person in Japan consumes a lot more than the average person in China. And probably more per person than any other country in the Asian world. But does this fact in and of itself actually improve the health of the average everyday Japanese person then? It is very rich in vitamins and minerals. Especially iodine --- but also contains A, B1, B2, B6, niacin, and C. And it is also known to help curb the formation of cholesterol deposits in the blood vessels and is high in protein (up to 50% of its dry weight). the obesity rate is just 3.2%; about 10 times LESS than it is here in the United States. Is there a connection? Maybe. Speaking of weight, there may actually be a connection between the 3.2% obesity rate in Japan and their overly enthusiastic consumption of algae in general. In 2010, a study found that algae can actually reduce our rate of fat absorption by almost 75 percent. This is due to algae's inhibitory effect on a digestive enzyme called lipase (which catalyzes the breakdown of fats). 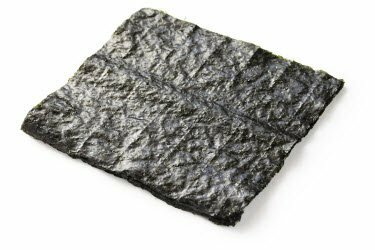 And as surprising as this may sound, one sheet of nori contains as much fiber as a cup of spinach and more omega 3 fatty acids than a cup of avocado while providing all of this nutritional power on less 10 calories per sheet. By comparison, the avocado contains 368 calories. Shocking isn't it? I actually didn't see that last one coming. Can Seaweed actually reduce the risk of Cancer? With all of the amazing and surprising things we have already discovered about seaweed health benefits, can it actually get any better? Seaweed may reduce cancer risk by providing antioxidants and anti-cancer properties that could reduce abnormal cell growth by up to 95%. A study at Universidad Complutense in Madrid, Spain concluded that consuming seaweed can have anticoagulant and antimutagenic effects, elicit strong antitumor activity, and plays a strong role in the modification of lipid metabolism in the body. 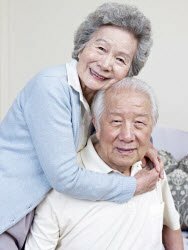 Conducted at Pukyong National University in the Republic of Korea published a study on the role of phlorotannins, a bioactive derivative found in edible seaweed. This is a significant study because phlorotannins has been linked to being an antiallergenic, antioxidant, anticancer, antidiabetic and anti-human immunodeficiency virus. 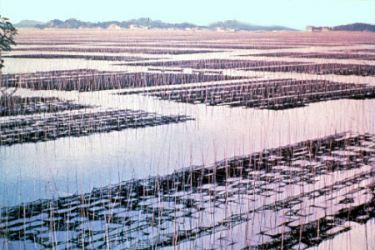 Without a doubt, there seems to be pretty significant evidence pointing toward seaweed health benefits. Good quality sushi nori probably won't be available in your local grocery store. If it is then you are indeed lucky. For the rest of us, the best place to pick it up is in your local Japanese grocery store. If you don't have any in your area you can find it online or here at Amazon.